Rolex Oyster Perpetual Cosmograph Daytona 116500LN. 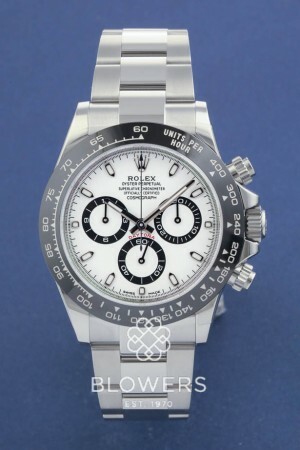 Rolex Oyster Perpetual Cosmograph Daytona 116500LN. Featuring a 40mm steel case and is water resistant to 100 meters. Automatic 4130 chronometer movement. 72 hours power reserve. White dial with black ringed sub dials and a black monobloc cerachrom bezel in ceramic with engraved tachymetric scale. The Rolex Daytona has been fitted with the ceramic bezel since 2016, the Hi-tech material is fully resistant to fading from ultra violet light and is more scratch proof than stainless steel equivalents. Oyster flat three-piece links, bracelet made from 904L steel which is used in production and transport of Sulphuric acid due to its high resistance to corrosion. Folding Oysterlock safety clasp. Box and papers dated September 2016. SKU: 3108872. Categories: Daytona, Gents, Rolex.